ZURICH – Drones are part of our life now, and they will be surely part of our future, too. After ambulance drones, now a new prototype is about to fly and take part in search and rescue operations. What is its peculiarity? It is a foldable drone. It has been showcased by a team from the Robotics and Perception Group at the University of Zurich and the Laboratory of Intelligent Systems at EPFL (Ecole polytechnique fédérale de Lausanne) that developed this drone. As they explained, they thought about birds and their capacity in folding their wings in mid-air in order to pass through holes and gaps. So, the idea was to realize a drone that can fold its arms to pass in narrow places. It can be very useful in carrying out SAR operations in places like caves, cliffs or even ruined buildings, where human efforts can be very dangerous for both the operator and the patient. The idea is to reach places unreachable to conventional drones, because of too narrow places. However, how can a drone fold itself while it is in flight? The answer is simple for the group of researchers and the idea does not crash against gravity or physical laws. 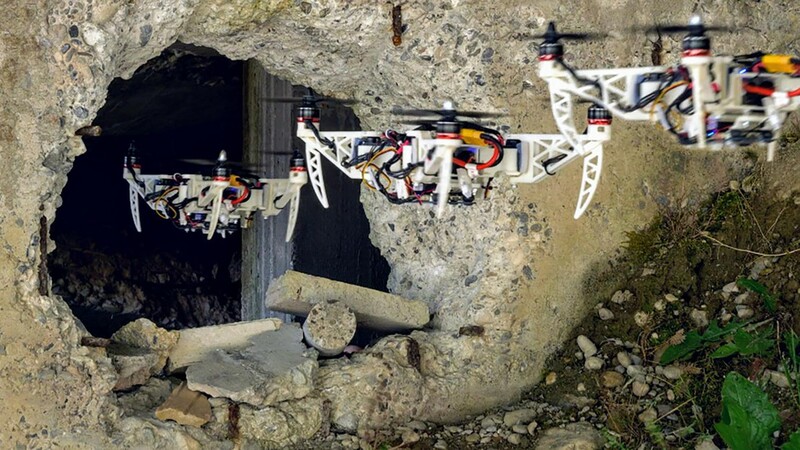 The group claims that the folding drone could enter buildings through gaps which are too narrow for conventional drones be used to look for people trapped inside and guide the rescue team towards them. As Davide Falanga, researcher at the University of Zurich and author of a paper on the project published in IEEE Robotics and Automation Letters said, this drone is very versatile and very autonomous, with onboard perception and control systems. The Zurich and Lausanne teams worked in collaboration and designed a quadrotor with four propellers that rotate independently, mounted on mobile arms that can fold around the main frame thanks to servo-motors. The control system adapts in real time to any new position of the arms, adjusting the thrust of the propellers as the centre of gravity shifts. The project co-author Stefano Mintchev affirms that the morphing drone can adopt different configurations according to what is needed in the field. The standard configuration is X-shaped, with the four arms stretched out and the propellers at the widest possible distance from each other. When faced with a narrow passage, the drone can switch to an “H” shape, with all arms lined up along one axis or to an “O” shape, with all arms folded as close as possible to the body. A “T” shape can be used to bring the onboard camera mounted on the central frame as close as possible to objects that the drone needs to inspect. The goal now is to look at further configurations and improving the folding drone structure so that it can morph in all three dimensions. They also plan to develop algorithms that will make the drone truly autonomous, allowing it to look for passages in a real disaster scenario and automatically choose the best way to pass through them. Massive emergency in Strasbourg after a terroristic attack at Christmas market: 3 victims and 11 injured.